UK Daily Mail, July 23, 2015. 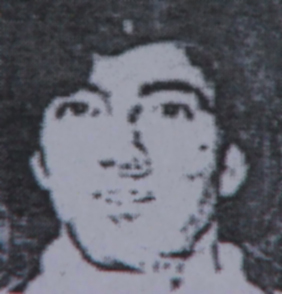 Is this the face of a “human-alien hybrid secret agent”? This is Jeffrey Alan Lash in a November 29, 2010, Dept. of Motor Vehicles driver's license. This is Jeffrey Alan Lash in a 1996, Dept. 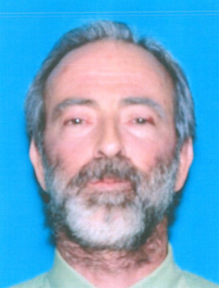 of Motor Vehicles driver's license provided by Los Angeles attorney Robert Rentzer to KTLA. 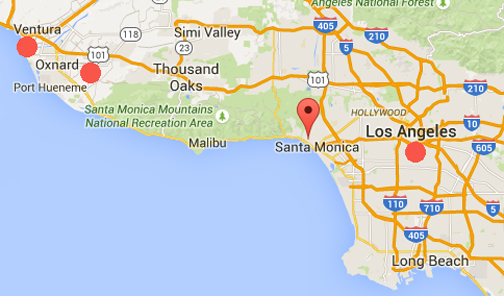 The Google pointer marks Pacific Palisades near Santa Monica about 50 miles southeast of Oxnard and Ventura, California (upper left red circles). Jeffrey Alan Lash and his fiancee, Catherine Nebron, shared a condo in Pacific Palisades. Dawn Marie VadBunker, 39, in Oxnard was hired in 2008 by Catherine to process paperwork for numerous real estate properties she has from Ventura to Santa Monica. August 28, 2015 - Oxnard, California - Since mid-July 2015, news about an alleged human-E.T. hybrid secret government agent working for the CIA, who died in an SUV near his fiance’s condo in wealthy Pacific Palisades community north of Santa Monica continues to surprise. One person with firsthand knowledge about the hybrid is Laura VadBunker, now 60 years old. Laura and her husband, David Roger, live in Oxnard, California. They have a son who in the past seven years had a close girlfriend named Dawn Marie Hannon. Dawn is now 39 years old and has two teenage girls of her own. Dawn is close to her 20-year-old daughter, Melody Hannon; and estranged from her 18-year-old.